My buddy and I decided that instead of doing this year’s Gambler 500-Illinois in the RallyMetro, we would do it on scooters. 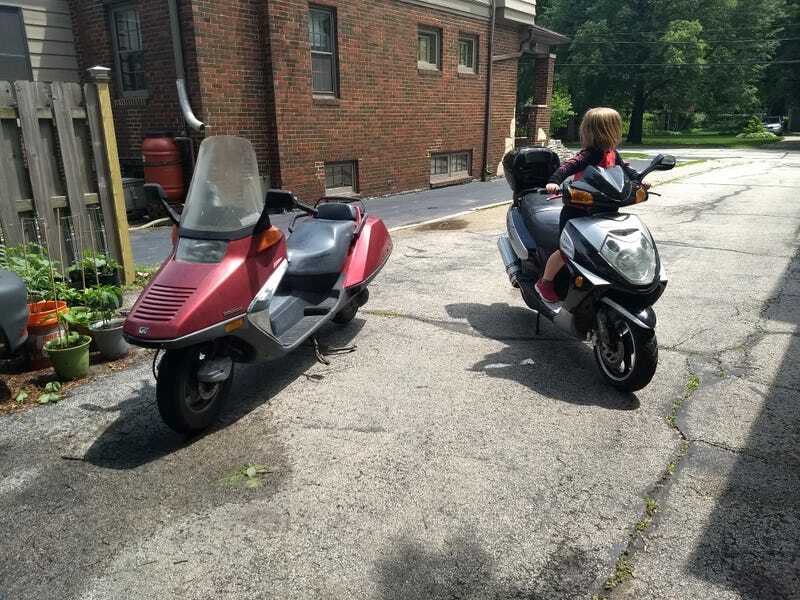 We have formed the Born to be Mild Scooter Gang. Our own Miss Mercedes was the first to purchase her Gambler scoot. This morning I picked up a janky ‘87 Honda Helix. It’s held together by electrical tape, zip ties, and sheet metal screws. It also sounds and smells like an old go-kart, but everything is there, and it all works. It needs a tune-up bad, but we’ll get her good to go. Not to be outdone, my buddy picked up a 150cc piece of Chinesium as well. It doesn’t need anything, but it has all the power of a kitten fart. He’s already thinking about flipping that one, and finding a janky Helix too.